Gah, why are you watching this game? Is it because you hate yourself? Is it because you're a degenerate? 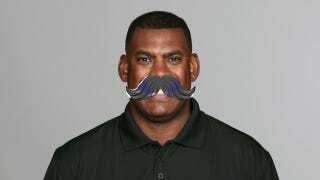 Is it because you like watching the soon-to-be-fired (Norv Turner) and the soon-to-be-not-retained-for-the-upcoming-season (Mel Tucker, pictured here)? We put a funny fake mustache on Tucker because apparently the Florida Times Union told Jaguars fans to wear it as a tribute to the new owner, Shahid "Shad" Khan, who has similar facial hair. Anyway, if you can't find anything better to do, this game is on ESPN at 8:30, and you can talk about it down here, if you dare.